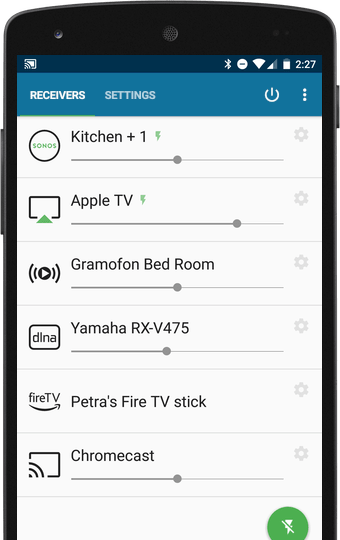 Stream all audio from any app to every receiver - with just 1 click! Use & stream your favorite music apps! 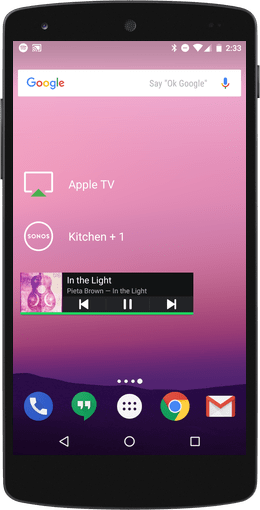 Enjoy Spotify, Google Play Music, Rdio, Deezer, TuneIn, Poweramp and any other audio on your Airport Express, Freebox, AV-receiver, Apple TV, Raspberry Pi, Chromecast, Nexus Player, ROCKI, Smart TV, Roku, SONOS, Gramofon, Denon HEOS, Fire TV, Samsung WAM and many more devices. Be it Spotify, Google Play Music, Rdio, Deezer, TuneIn or Poweramp.. really any app on your Android can be streamed! 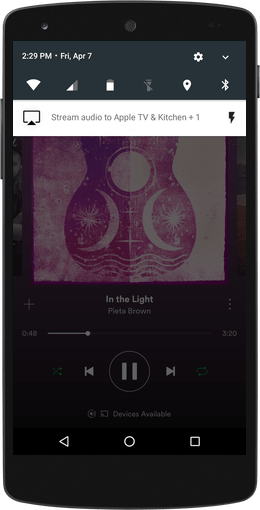 If you listen to your music & a receiver is available, AirAudio gently notifies you and streams your audio with just 1 click! 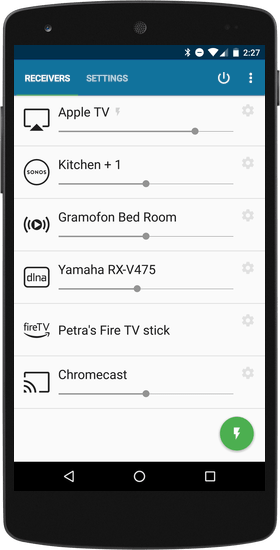 Create widgets for your favorite receivers or use Tasker to manage your connections! Automatically connect when coming home or starting your music. Smart TVs or AV-receivers like Samsung, Sony, LG, Pioneer, Yamaha, Denon, Bose or Onkyo, XBOX 360 etc. AirAudio is the most powerful audio streamer for Android! Its outstanding features guarantee easy & seamless streaming for all your music. Sets the bar for audio streaming apps! Works great on lollipop. Love that it works with my Apple and Roku devices. Been absolutely loving this app on both my Nexus devices 5 and 7. It workes all the time and the sound is the best the developer is very very helpful and replay so quickly and even help me with an upgrade on my G3 this was an A class service all around. I used this to play audio from my smartphone to my sonos. It worked perfectly the first time I tried and only took a few seconds without reading any instructions. Very intuitive. I've been using this since it came out and the developer keeps adding more and more functionality and keeps it well updated for new phones! Awesome support too. Hats off to this guy. Best app I ever paid for. This app is a godsend and is allowing me to stream what i need. AirAudio is clean, simple & intuitive to use. Its widgets & the 'intelligent notification' integrate seamless into your Android.